The Northeast just endured one humdinger of a snowstorm. The weather service named this whopper Jonas. Weird to give a name to a weather event, but that is the custom. Whatever we call this monster of a snow – everyone has been effected. 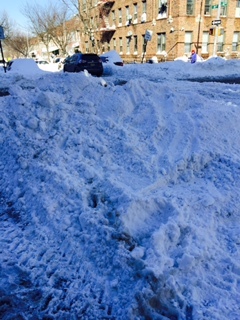 Where I live, in Jackson Heights, we had 34 inches of snow. attempt to travel in, or get yourself to work in. of snow plows on the secondary streets. Calls to 311 and lots of complaints. How does a resilient person live optimally in such a severe storm? We listen to the information given by the news. We don’t go into denial. We get the supplies we need. We accept that we may have to cancel plans. or alcohol, endlessly texting or playing video games or withdrawing away from others. that closet, drawer or whatever chore that you have been postponing for a year? Or doing something that will bring you closer to yourself and to others. Every experience offers us lessons about life. Living optimally means having the ability to discern the lesson. I learned the wisdom of letting go! I learned that winter is bigger than I am. We live in a culture that is obsessed with mastering nature. A first step to cultivating resilience.